Patient 40 yr Old male presented in emergency hours immediately following trivial fall with the above X ray. Patient denies any history of previous fall or injury to the same limb in the past. 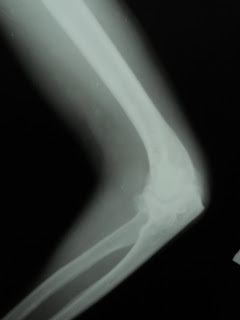 Radiologically arthritis is present with some distortion of the upper end of radium and ulna. Could be some type of healed childhood infection, since it is non tender. Small pox usually ends in bony ankylosis. What about other joints? Some patients may not notice 30deg FFD as a disability at all and they think it is normal for them since the deficite is from childhood. Some wasting is also expected. Please comment about other clinical findings like muscles and skin. Other joints are clinically normal sir.. There is no gross wasting in the rt upper limb muscle groups..